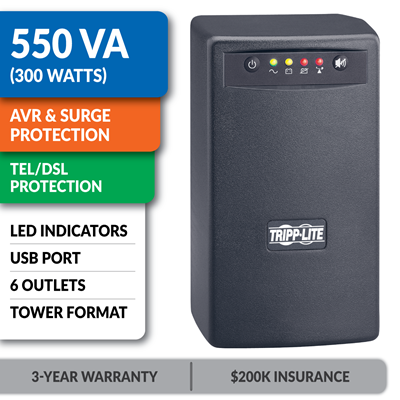 Tripp Lite's SMART550USB line interactive UPS system offers voltage regulation, surge suppression and long lasting battery support for personal computers, internetworking equipment and other sensitive electronics. Internal UPS circuits support entry level PC systems for up to 30 minutes during power failures so that connected equipment can be shutdown without data loss. Automatic Voltage Regulation (AVR) circuits regulate brownouts as low as 89 volts back to usable levels without using battery power. Offers complete desktop power protection in an attractive stealth black tower configuration. Includes 3 battery supported outlets for computer, monitor and one vital system peripheral, plus 3 additional surge suppression-only outlets for printers and other system accessories not requiring battery support. USB port enables optional unattended system shutdown without data loss in the case of extended power failure, USB cable included. PowerAlert software available via free download from www.tripplite.com. Built-in single line RJ11 phone suppression jacks protect modem, fax machine, cordless phone or other peripheral with a standard dialup/DSL phone connection. Built-in audible alarm and 4 front panel LEDs indicate line power status, battery power status, battery low/replace status and overload status. 550VA/300 watt power handling ability supports entry-level PCs, network workstations, point-of-sale equipment, small business phone systems, audio/video equipment and home theater systems. Offers 4.6 minutes battery runtime with a full load of 550VA/300 watts and 14.8 minutes with a half load of 275VA/150 watts. Supports battery replacement via built-in access panel. Status Indicators 4 LEDs indicate performance conditions: GREEN "online" / GREEN "voltage regulation enabled" / RED "on battery" / YELLOW "battery low/replace"
USB port connects to computers for power management. 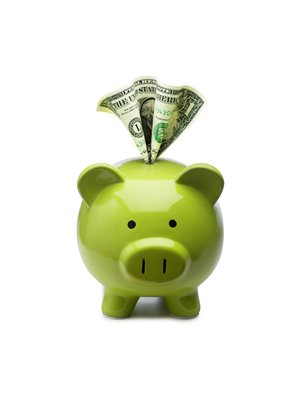 3-year warranty and $200,000 insurance reflect commitment to reliability. It would be nice if utility power was always reliable, but it isn’t. Between severe weather, the aging electrical grid and hazards lurking inside your own walls, your equipment is under constant attack from power problems. Even a brief loss of power or a momentary surge can ruin your equipment and destroy irreplaceable data. Single-Computer Runtime: This UPS system will support an energy-efficient desktop computer and LCD monitor for up to 30 minutes during an outage. Half-Load Runtime: This UPS system will support a 50% load (150W) for up to 14.8 minutes. Optimized Outlet Array: 3 outlets have both battery backup and surge/noise protection, and 3 have surge/noise protection without battery backup. The "surge-only" outlets allow you to connect additional equipment without overloading the UPS or reducing the backup runtime available during an outage. Select outlets have extra-wide spacing to accommodate bulky AC adapters without blocking adjacent outlets. Data and audio/video lines connected to your equipment represent an unlocked "back door," allowing surges to enter and damage or destroy sensitive electronic components. In addition to protecting against surges on the AC power line, this UPS system protects your equipment against surges on connected phone and network lines. The RJ45 jacks protect a phone, analog modem, DSL modem or Ethernet network line. The intuitive LEDs display a variety of helpful and important information, including line power status, overload status, battery power status and battery condition. Use the USB port with Tripp Lite's free PowerAlert® software. PowerAlert provides enhanced features like automatic file saves, event notification, logging, advanced device control and a web accessory card that supports centralized management.